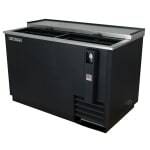 The True TD-50-18-HC forced-air bottle cooler accepts 16.5 cases of 12-ounce bottles or 24 cases of 12-ounce cans. Inside, three PVC-coated dividers separate and organize drinks, creating quick serve times. With its forced-air cooling design, bottles on the top are cooled first so that customers get cold drinks. The unit's temperature ranges from 33 to 38 degrees Fahrenheit and is maintained by R290 hydrocarbon refrigerant in the self-contained capillary tube system. Its refrigeration system is highly accessible since it slides out from behind the front grille. The black powder-coated, cold-rolled steel front, sides, and back will not chip or peel with regular use, and the stainless steel countertop and lids withstand long-term use. Accessed by two sliding lids, the interior retains cold air through foamed-in-place polyurethane insulation. 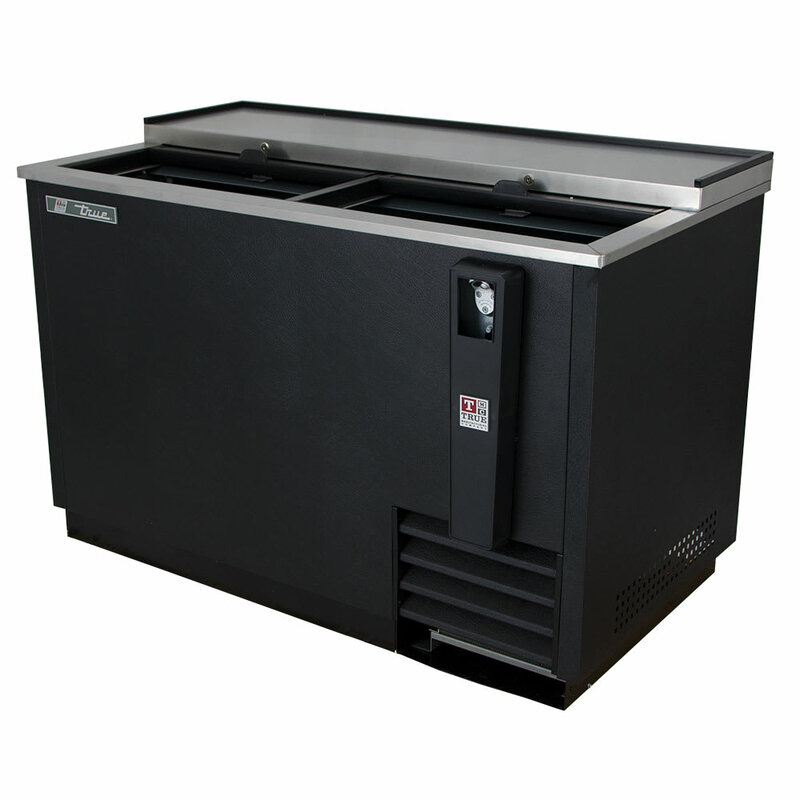 This True TD-50-18-HC forced-air bottle cooler has a galvanized steel interior that can be wiped clean and a black frame rail that adds structure. 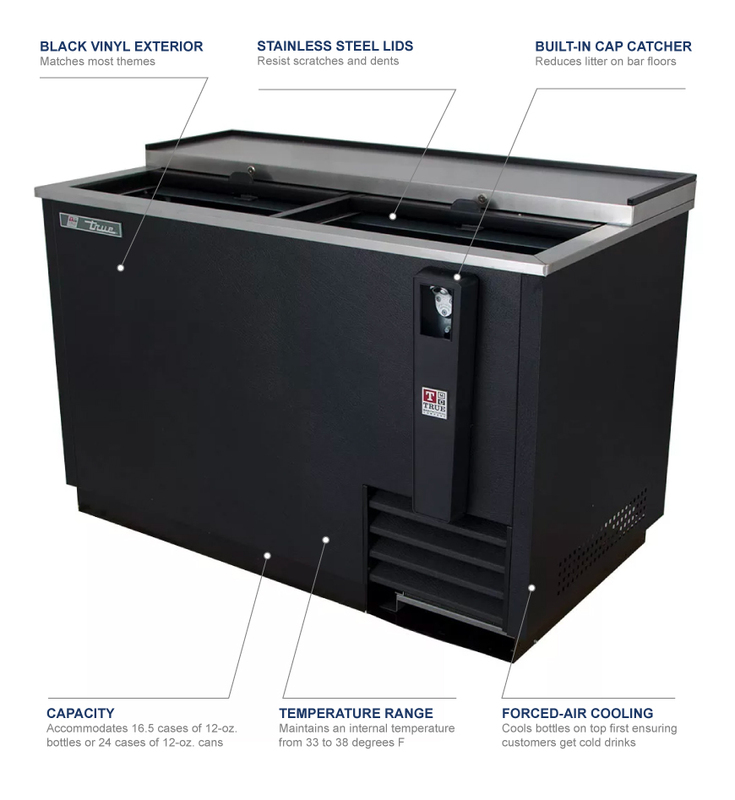 Check out the article on bar refrigeration for more in-depth information on these units. "Straighten the drain for cleaning. Use expanded metal mesh for the dividers instead of current wire setup, bottles get hung up. Cooling works..."
"Hello, Please consider for product improvement to True underbar bottle coolers.. 1, Cooler interior rear side is not flat (don't stack properly)..."
Good cooler, serviceability not so much. "Straighten the drain for cleaning. Use expanded metal mesh for the dividers instead of current wire setup, bottles get hung up. Cooling works well. Cost effective for us. Would like to see annual energy costs listed for all units in terms of Kw consumed as all coolers run 24/7. When cooling cans, the products stepped rear wall traps cans under it." "Hello, Please consider for product improvement to True underbar bottle coolers.. 1, Cooler interior rear side is not flat (don't stack properly). 2. Cooler bin dividers too wide (allow bottle caps to fit through/spillage).. 3. Drain difficult to clean. Your True under bar coolers are designed with the rear interior of the cooler not flat, this causes products such as bottles to not stack properly. nearly every shift! Also, the dividers between the cooler bins are just wide enough to allow bottle caps to fit through them after they fall over from not stacking properly because of the aforementioned issue of the interior rear not being flat. Shouldn't the dividers be just small enough to NOT allow bottle caps to fit through?! So the falling product makes for extra work to keep restacking, also increased spillage when the bottles fall. If the bottles fall and go through the divider the cap is at risk of coming off when the bottle is pulled back through the divider. Once again, this causes spillage. How to clean the spillage? Pull ALL the bottles out to clean the bottom of the cooler! That's more work, only to clean it and get it stacked again, and then have it happen again, over and over again. Your coolers are TRULY poorly designed. I can not recommend them, and will shop for brands that are designed in a more efficient manner and practical for staff. Also, the drain is too close to the side wall, making it difficult to get a full size plunger on it. So a small plunger is required, but even a small plunger is too big to get on top of it properly. Also, the drain does not go straight down to below the cooler, it makes turns on it's way out. This increases clog areas, and makes draining more difficult. A shorter run, straight drain that goes straight down would be beneficial because it would have a shorter run, and also would not go against gravity. Also, a pipe tube brush could be used to clean it if it was a straight drain, in addition to or instead of a plunger. A"